The heart shape diamond is considered to be the most romantic diamond cut of all time. The specific cut represents romance, sensitivity and sentimental. The heart shape diamond is perfect for the ever-romantic and can be set in rings, earrings and pendants to celebrate the love you share. The heart shaped diamond dates back centuries, and is truly the most romantic of all diamond shapes. It was first mentioned in correspondence between the Duke of Milan, Galeazzo Maria Sforza and Nicodemo, in 1463. In 1562, Mary Queen of Scots sent a heart shaped diamond ring to Queen Elizabeth; these diamonds were exchanged between royalty for hundreds of years as a symbol of good will and friendship. The origin of this shape can be found in the pear shape diamond, with the heart shape being directly derived from it. The heart shape diamond essentially begins as a pear shape. It is essential to have a highly skilled diamond cutter, to ensure the distinctive lobes are balanced, smooth and well defined, while retaining a brilliant shine. A brilliant cut, the heart shaped diamond can radiate with a sparkle similar to that of a round brilliant cut diamond. It features 59 facets, each one polished to perfection to achieve the maximum amount of brilliance. The heart diamond shape is a modified brilliant diamond and can vary greatly in length and width. The ideal length to width ratio is 1 to 1. The setting itself should have five prongs to ensure security, stability and protection. When purchasing a heart shape diamond, symmetry is a very important factor to consider, as it is crucial that each of the two halves of the heart are identical. The cleft (the part between the two lobes) should be sharp. Heart shape diamonds tend to retain the body colour of the diamond, especially near the tip of the stone. When a heart shaped diamond is smaller than 0.5 carats, it is sometimes difficult to distinguish as a heart, especially when it is set in prongs. For small heart shape diamonds, a bezel or three prong setting best preserves the heart shape of the diamond. An age-old romantic symbol of love, the heart is an ideal pendant diamond. It is favoured as a Valentine’s Day or birthday gift, and is not often set in an engagement ring, although it makes for a unique and striking solitaire ring. It is sometimes also favoured for earrings. 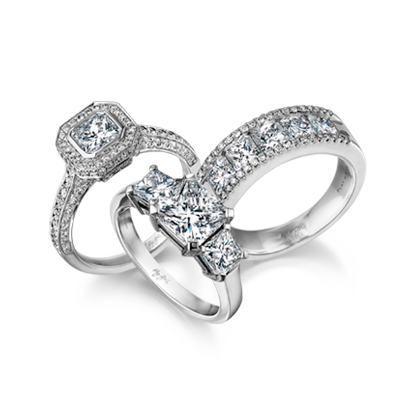 Personalities drawn to the heart shape of diamond tend to be sentimental, sensitive and romantic.